Cedar Plank Smoked Salmon is remarkably nutritious, ridiculously easy to make, and exceptionally delicious. It’s also a recipe that you will want to keep close at hand this grilling season! Through the years my son, Isaac, has become quite the chef. He loves to experiment with various herbs, seasonings and different styles of cooking. It’s always fun going to their home, spending time together and experiencing the wonderful food. From his gourmet grilled pizzas to his Cabbage Roll Soup, (and many other delicious creations in between), Isaac never ceases to amaze me. By her own admission, Becky would much rather bake than cook, so they have an agreement. Isaac usually does most of the cooking and Becky usually does most of the baking. A match made in heaven! Recently, Isaac and Becky purchased a Big Green Egg Grill. 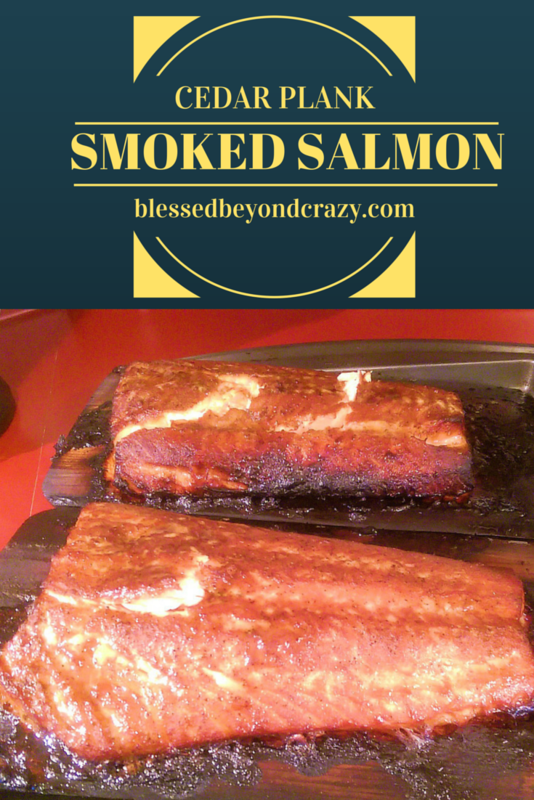 This recipe for Cedar Plank Smoked Salmon is one of his creations. He purchased cedar BBQ grill planks and used them as a platform for grilling the salmon. Using Wood Planks for Grilling, (cedar, alder, cherry, maple, white oak, and hickory), is an easy way to instill a smoky, woodsy flavor to meats, vegetables, and especially salmon. Follow the instructions on the box of cedar planks, (usually, you soak the planks in water or cider for a few hours beforehand). For this recipe, Isaac made a marinade using brown sugar, wasabi powder, (Sushi Sonic 100% Real Powdered Wasabi) salt and pepper, and soy sauce. Add enough soy sauce to make the marinade into a medium thin paste, (be careful not to make the sauce too thin and runny). Adjust as needed. Marinate the salmon for at least an hour, or you can marinate the salmon overnight. Depending on how much salmon you are grilling you will need to make more or less marinade. Isaac says that “You really can’t put too much on,” so he suggests slathering the marinade on pretty thick. In a mixing bowl, combine brown sugar, wasabi powder, salt, pepper, and soy sauce. Add enough soy sauce to make the marinade into a medium thin paste, (be careful not to make the sauce too thin and runny). Slather marinade sauce over salmon. Marinade the salmon for at least 1 hour, or overnight. Preheat grill to 350-375 degrees. Place salmon onto soaked cedar planks and then place it on grill. Cook for about 15-20 minutes,or until salmon looks almost burnt on the top. Don't open the lid for the first 15 minutes. Depending on how much salmon you are grilling you will need to make more, or less marinade.